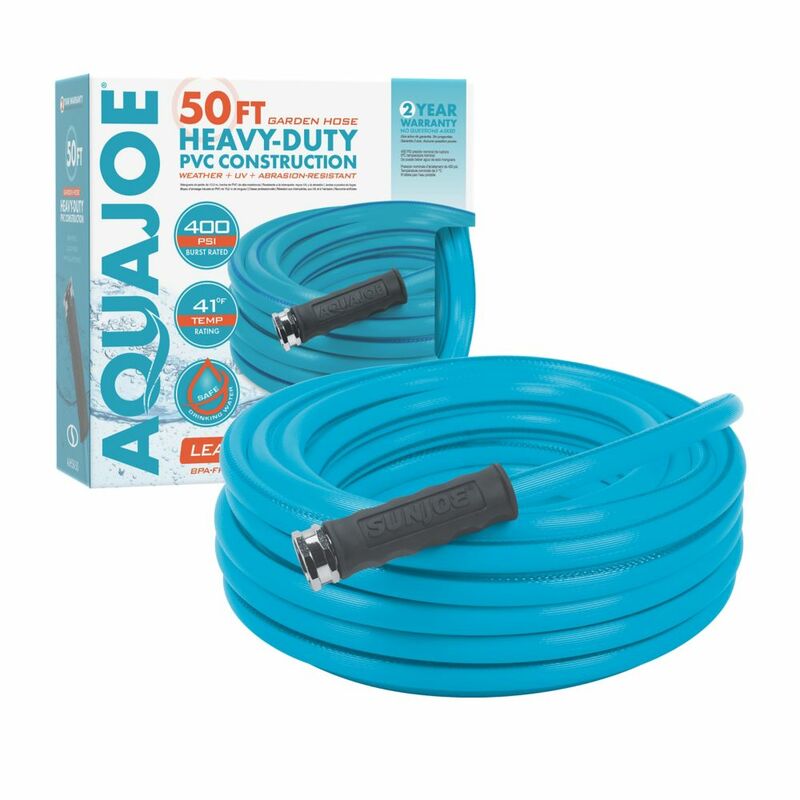 Take the water where you want it with the AQUA JOE heavy-duty garden hose. The 5/8-inch flow, kink-resistant 50' hose features durable zinc fittings for secure, leak-proof connections plus a protective bend-restriction sleeve for uninterrupted flow. Constructed of rugged, kink- resistant high-grade PVC for maximum durability and performance. Lead-free, phthalate-free and BPA-free. Perfect for watering the flowers, washing the car, rinsing patio furniture or connecting to a lawn sprinkler. 5/8-Inch x 50 ft. Heavy-Duty Garden Hose Take the water where you want it with the AQUA JOE heavy-duty garden hose. The 5/8-inch flow, kink-resistant 50' hose features durable zinc fittings for secure, leak-proof connections plus a protective bend-restriction sleeve for uninterrupted flow. Constructed of rugged, kink- resistant high-grade PVC for maximum durability and performance. Lead-free, phthalate-free and BPA-free. Perfect for watering the flowers, washing the car, rinsing patio furniture or connecting to a lawn sprinkler. 5/8-Inch x 50 ft. Heavy-Duty Garden Hose is rated 4.0 out of 5 by 12. Rated 1 out of 5 by HomeDepotCustomer from Kinked terribly.... Kinked terribly. Rated 5 out of 5 by amatthews from Lightwieght! We've been dragging around an old 75 ft. hose for over 12 years. This 50 ft. SunJoe is so lightweight and much easier to maneuver. We keep it coiled next to our hose bib and inevitably there will be a kink here or there but no where near as bad as the old one! Its the nature of the fact that is is round, kept coiled, pulled this way and that way that any hose will kink sometimes. We also bought a 25 ft, which doesn't really kink because we are often using it fully stretched out. The connectors are sturdy, but we found that we had to double gasket it to keep it snug against the spout to avoid leaks.Would definitely recommend! Rated 5 out of 5 by Ken C from Great product Ordered this hose to replace one that always leaked at connector to the bib. Tried replacing and adding washers to the old hose fitting to no effect. This new hose had a very snug fitting and operates as expected with no leaks, as expected. Rated 3 out of 5 by Ed from Very hard to roll back up on storage rack.... Very hard to roll back up on storage rack. Rated 3 out of 5 by Cynthia from The hose is not kink free as advertised. ... The hose is not kink free as advertised. Rated 5 out of 5 by thegardenlady from It Matches our other lighter weight sun joe hose perfectly. Together they make the perfect hose. It Matches our other lighter weight sun joe hose perfectly. Together they make the perfect hose.